If you have lost your My Waitrose card or your Waitrose Partnership card and you need a replacement you can follow the instructions on this page to find out what you need to do to replace your card. The Waitrose loyalty card scheme is called My Waitrose. The loyalty scheme gives you rewards in different ways to other loyalty schemes, instead of earning points everytime you shop you immediately can get things for free, save money on your Waitrose shops and win prizes. You can access all the information about the card on the Waitrose website as well as log into your My Waitrose account and view your rewards. If you lose your card you will still have access to these offers whilst waiting for your replacement card as you will still be able to log into your account on the website. If you need to replace you’re My Waitrose card you need to log into your online account on the Waitrose website and fill out a ‘self-help’ menu form. You can find the self-help menu by clicking on your profile in the right-hand corner and you will see a ‘contact us’ button, select this and you will be taken to the self-help menu. You then need to click ‘myWaitrose’ and then ‘Replacement card or keyfob’. You will then be given multiple ways to contact the Waitrose team but the easiest and quickest way to receive your card is by calling the team on 0843 557 4797. You should receive your replacement My Waitrose card within 7 working days if you have still not received your card you can call the number above to inquire about when you are due to receive your new replacement card. Whilst you’re waiting for your new card to arrive you can receive a ‘temporary virtual’ card. You just need to go to the Waitrose website and sign into your account, then you need to click here and you will be able to view your card number. You can write this number down, take a picture of it with your mobile phone or print it out. You will be able to show a cashier this number and they will be able to input your card number into the till. 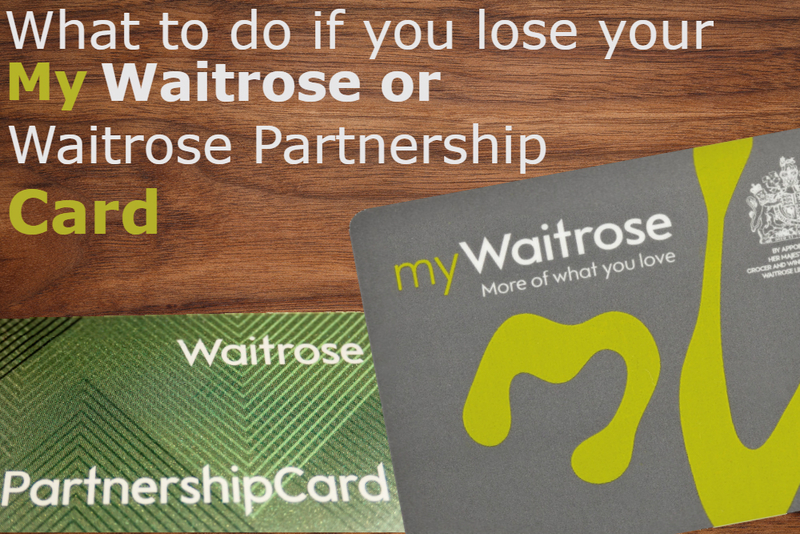 If you have lost your Waitrose Partnership card you can visit either the Waitrose website or the John Lewis website. If you log into your Waitrose account on the Waitrose website you will be able to view your partnership card and request a new one to be sent to you. If you’re struggling to request a replacement Waitrose Partnership card online you can call 0843 557 4797 to speak to a member of the Waitrose team who will be able to request a replacement card to be sent to you. You should receive this card within 7 working days and you can ask the Waitrose team via the phone number how to still use your card whilst waiting for the new card to arrive in the mail.